I was going through all my old Google Docs this morning and found something called ‘Commuting’. I opened it up and it’s a recollection of the commute I had to work in the morning when living in my first flat in Cambridge three years ago. 7:37 according to the microwave. Better leave the house. Don’t want to chance it with the 7:55 bus. Bus stop. Am usually the only one waiting for the 7:45 bus. Hop on bus, top deck. The usual gang is here. There’s one of the dark haired guy with glasses who always reads. There’s two of them and they look similar except one has a light coat and alights a few stops before the one in the dark coat. Have never seen them both on the bus though. Curious. The middle aged Asian man who I always imagine is some sort of doctor. No sign of the white haired man who alights at the rail station as well. Stop in front of Round Church. Will the girl with the pony tail board today? Doesn’t look like it. The couple in the high visibility jackets alight as always. Up Hills Road. Stop in front of St. Paul’s church. Young girl in a school uniform at the front of the bus leaves, lady with the short hair arrives to take her place as always. Station Road. Time to get up, hit the stop bell and make my way down to the lower deck. Lots of time to kill this morning. It’s just gone 8. Queuing for a ticket. Today we have a queue for each ticket machine. Other days we seem to just have the one queue. All depends on the people who start them. Pop into M&S Food for a pain du chocolate and a juice. Take a quick look around to confirm that I don’t need anything else. The super friendly Chinese lady is on the till. Hey they have a stock of small bags again. That’s ok though, I don’t need one. Through the barriers and onto the platform. It’s early enough that people aren’t dashing for the 8:15 to King’s Cross. The first four coaches are already waiting at the far end of platform 1. There’s a collection of people waiting for the last four coaches to arrive at this end of the platform. 8:18 time for the guy to go running down the platform with his bike to either just make the 8:18 to Liverpool Street or just miss it. Why doesn’t he just leave a few minutes earlier? The mind boggles. Girl with the yellow bag. Train stops in Shelford. Girl with the Shelfridges bag standing at the barricade lights a cigarette. And there it stops. I didn’t even get to the bit with the three or four people with their bikes that always alighted at Great Chesterford as well. Wonder if they still get the same train, or if they noticed that the girl with the headphones stopped getting the train just over a year ago. 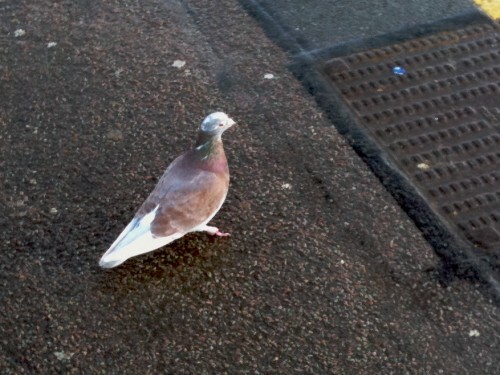 Goodness, the pigeons that are around the station in the morning always seem to be in such rough shape. Bits of wings missing, and most commonly bits of feet/claws missing or mangled. Spotted this fellow on platform 4 this morning and felt quite bad for him. His left foot was missing a claw and the two that were left were looking worse for wear. His right foot was basically gone and he was hopping around on a stump. Is this pretty common for pigeons? I never really take much notice or am close enough to them to notice except for when we share train platforms.